Re: British Airways and the Brexit? sean1982 wrote: Dont know why you are getting so worked up about this. The people voted for Brexit by a small majority. Politicians now have to make it happen keeping the best interests of the WHOLE country in mind. (If not you get Trump-like protests) I think everyone with a bit of common sense can understand that strong Ties with the EU are in the best interests of both parties. Off course concessions willen made. Ha! Ha! Worked up? Surely not Sean; I was just giving my reading of the consequences of the Brexit vote. But I respect the decision of the people, even though I believe it was a mistake. He said Brexit would be a boost to his own country, Ireland. “I think we should enjoy the entertainment and the spectacle that Brexit is bringing to us,” he said. Ryanair could cease flights within Britain once the country leaves the EU, rather than take steps to comply with new regulations. The carrier might have to require a UK AOC, in order to continue domestic services there once Brexit is implemented. Ryanair is planning for major disruption in its business as a result of Brexit including the outside possibility it may have to move its entire UK fleet to continental Europe, Chief Executive Michael O'Leary told Reuters in an interview. Europe's largest airline by passenger numbers, the Irish carrier flies one-third of its 120 million passengers from UK airports, leaving it among the most exposed in the industry to Britain's decision to leave the European Union. An "Armageddon" scenario, in which a hard-line approach from both sides leaves planes unable to fly between Britain and the EU at the end of two years of divorce talks is "unlikely, but a possibility," O'Leary said. "We have a plan, we think, for every eventuality," he said. "But the reality is no one bloody knows." Even in the best-case scenario in which Britain retained access to the EU's "open skies" deregulated aviation market, Ryanair does not plan to deploy to the United Kingdom any of the 65 planes it has due for delivery during Brexit talks. Open Skies, which allows EU airlines to fly to and from any airport within the bloc, has been a key element in Ryanair's business model. The first problem for the aviation industry is the short lead-in time to Brexit, which may not provide enough time for an EU-UK bilateral aviation agreement. Like other airlines Ryanair plans its schedule 12 months in advance. The second is politics. The impact of leaving the European Union on aviation will be among the most visible to the British public and may be a tempting tool for EU leaders keen to pressure Britain to soften its position, he said. "If the Europeans want to be difficult with the British, and I think they do, I think 'Open Skies' is where they will first cause trouble," he said. "Merkel cannot give Britain an easy exit from the EU." The worst case scenario, which O'Leary said "unlikely but a possibility" is a hard Brexit in which flights between Britain and the European Union simply cease on the day after Brexit. "It would be inconvenient for the Europeans, but the UK would get completely screwed," he said. That could require Ryanair to move its 13 UK bases, which employ over 3,000 people and operate over 100 planes, to bases in continental Europe. "If we had 12 months' notice, we could re-house 100 aircraft into continental Europe - I mean we have 84 bases," he said. 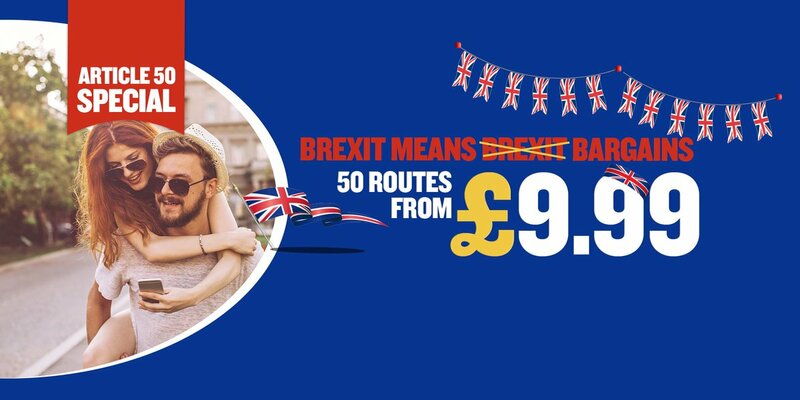 "But it would mean significant over-capacity (on intra-EU routes) ...and there would be downward pressure on pricing and on profits for a year or two." If a bilateral deal is agreed in time, Ryanair would still likely have to set up an entity with a British Air Operator's Certificate (AOC) in Britain to fly internal routes, which currently represent around 1 percent of its flights. Ryanair could only own 49 percent or less in the entity under EU rules, he said. "There are 500 different scenarios, some of them involve us closing them [the UK routes] down, most of them don't," he said. easyJet and British Airways owner International Airlines Group would likely have to set up separate entities in the EU and Britain with each entity owning less than 49 percent of the other, he said. easyJet has said it is in the process of setting up an AOC in an EU country and IAG has said it does not foresee problems with its ownership structure. O'Leary said he was focusing on contingency planning rather than lobbying because "most of the industry is in denial... and the UK are just talking to themselves." He said he was hopeful that once British negotiators present a draft agreement, British public opinion might begin to change and strengthen the hand of those pushing for a soft Brexit or to remain in Europe. Ryanair will take its full schedule of deliveries from Boeing and hit its target of 200 million passengers by 2024, even if it has to take lower profits, he said. EU-US open skies may not apply to UK post-Brexit! The UK's secretary of state for exiting the European Union has indicated that the country may not have access to EU-US open skies after its departure from the bloc. New Zealand, Singapore, Brunei, etc. also have an open skies agreement with the USA, even though they are not part of the EU. So who needs the EU ? Norway and Iceland, not members of the EU, became party to the EU-US agreement too. Again, who needs the EU? The UK is an important enough business partner, not to mention political and military ally of the USA to have an open skies agreement all of its own if necessary. Probably, but the same goes for their access to the common market. It's the price of freedom : paying for not being told what to do in your own country. One may be for or against Brexit, for or against the EU, but let's limit our discussions to aviation, please. And one must recognise that open skies (as promoted by the EU) are in the best interest of passengers! British Prime Minister Theresa May will officially start the Brexit on 29th March 2017. Politics aside as you say, it's only logical that the UK as a country can not piggy back on any existing bilaterals between 2 (then) third countries, like the US and the EU in this case. Ideally before brexit is completed, the UK will have to have a new US-UK bilateral in place, but it remains to be seen if indeed such is possible to do with the current US government and whether or not it will be better, if anyhow different, from the present one indeed. On top of that, the UK will also have to spend time on putting similar replacement deals in place with a whole range of other countries or trading blocks and already now its clear there will (initially) be less as it can't do it all in just 2 years of course! But most importantly of all, what should be most worrying to airlines in the UK is what a future possible UK-EU bilateral will look like, if any. 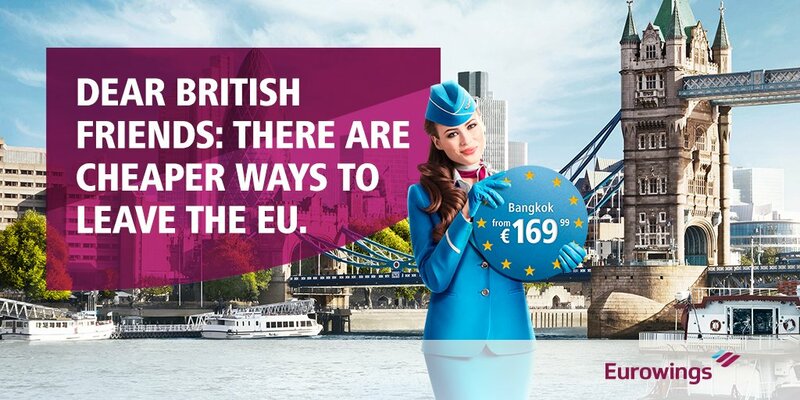 Without such an agreement, their airlines are in the same league as airlines from say Belarussia when it comes to operating to the EU memberstates and the affiliate states, meaning that to the exception of maybe British Airways, none of them is allowed to fly TO/FROM the EU etc and none (including BA) will be able to fly IN the EU! Airlines like bmi, flybe, easyjet, but even Ryanair (which post-Brexit will no longer have a majority EU shareholdership!) will undoubtedly be greatly affected. I don't know if people fully understand the irony, but when the UK triggers article 50 somewhere next week, the British PM basically hands over control over the writing of future rules and regulations and thus also over the way in which almost half of the UK's economy will effectively be forced to operate under for the long run to the EU, because she'll have to accept whatever is offered to her, or walk away completely empty handed! Never seen anybody willingly surrender so much legal power over the governance policies of its own economy without a single shot being fired! if you are in a similar bargaining position like the EU will be in during a corporate merger and/or spin off talk, the team on their side of the table is already booking appointments with their bank to discuss what to do with the huge bonus they'll be cashing in at the end! Reading the Daily Mail may clearly cause serious injuries! They wanted an island they'll have it. With a smile. Lufthansa CEO Carsten Spohr expects France and Germany to take a hard line against the U.K. aviation industry in Brexit negotiations, threatening to disrupt flight connections across Europe. For Spohr, "Brexit is Brexit", and he does not expect any special treatment for the aviation industry, something that the UK airlines are asking for. Statement by the European Council (Art. 50) on the UK notification. Brussels, 29 March 2017. Today, the European Council received a letter from the British Prime Minister, Theresa May, notifying the United Kingdom's intention to leave the European Union. This notification follows the referendum of 23 June 2016 and starts the withdrawal process under Article 50 of the Treaty. We regret that the United Kingdom will leave the European Union, but we are ready for the process that we now will have to follow. For the European Union, the first step will now be the adoption of guidelines for the negotiations by the European Council. These guidelines will set out the overall positions and principles in light of which the Union, represented by the European Commission, will negotiate with the United Kingdom. In these negotiations the Union will act as one and preserve its interests. Our first priority will be to minimise the uncertainty caused by the decision of the United Kingdom for our citizens, businesses and Member States. Therefore, we will start by focusing on all key arrangements for an orderly withdrawal. We will approach these talks constructively and strive to find an agreement. In the future, we hope to have the United Kingdom as a close partner. Ryanair calls for aviation to top Brexit negotiations agenda. Why is Ryanair so adamant to have successful Brexit negotiations on aviation matters? Because, despite the fact that Ryanair is an Irish company, its shareholders are in majority English and American. Hence, in the case of Brexit, Ryanair would be considered as a "foreign" company and lose all its traffic rights within the EU! That would be catastrophic for the low-cost airline. Michael O’Leary also says flights between the UK and the EU will be cancelled for months after Brexit, unless replacements for EU airline agreements are struck before Britain leaves the bloc. Ryanair could speed up share buybacks to comply with EU ownership laws as a result of Britain leaving the EU. Following a rigorous and comprehensive process, easyJet earlier this year applied to Austro Control for an Air Operator Certificate (AOC) and to Austria's Federal Ministry for Transport, Innovation and Technology (bmvit) for an airline operating licence. The accreditation process is now well advanced and easyJet hopes to receive the AOC and licence in the near future. These will allow easyJet to establish a new airline, easyJet Europe, which will be headquartered in Vienna and will enable easyJet to continue to operate flights both across Europe and domestically within European countries after the UK has left the EU (regardless of the outcome of talks on a future UK-EU aviation agreement). The people and planes that will fly for easyJet Europe are already employed and based in EU27 countries. In a move similar to easyJet, Ryanair plans to flood 72 of its bases in continental Europe and Ireland with 85 UK-based B737-800s, in the event of a hard Brexit. If there is no clear agreement by September 2018, the carrier plans to remove many flights to and from England in summer 2019. Not the same at all, the opposite in fact! EasyJet is setting up a double AOC to keep its current network. Ryanair is, currently, not looking for UK AOC and will, temporarily, reduce their UK network by transferring aircraft to the continent should they not be allowed to fly UK domnestics on an EU AOC. The Ryanair approach is certainly more cost effective, they will only apply for an AOC in the UK if needed.